I am so excited to have finally shifted our family to a plant-based diet. It makes me so happy, I watch vegan videos on YouTube to lift my mood if I get down. I enjoy cooking a gazillion times more now. My cooking has gotten so much better too, maybe because I am taking much more pride in it. But there is another reason that cooking this way has been so exciting: it has put me in alignment with several issues I have struggled with for probably my whole life, even if I didn’t always put words to my discontent. I don’t hurt or kill animals to eat. Simple as that. Now, I feel the need to stress that I am not a pet person at all. I have had pets that I loved, pets that I still think about today, but I’m not a ‘pet person’. I am really allergic to cats, and I’m mostly terrified of dogs. I grew up on a hobby farm in northern British Columbia and we had a menagerie over the years. Most animals kind of freaked me out. I am skittish at the best of times, so animals were intimidating to me. We had, at various intervals, dogs, cats, chickens, goats, steers, rabbits, pigs, and horses. When I was nine, Debbie and I helped our parents kill 20 chickens and process them in one day. It was an experiment never to be repeated because even for my meat-eating parents who had grown up on farms themselves, the whole thing was disgusting. Apparently we didn’t actually eat the chickens for months because they couldn’t get the sights and smells out of their heads either. So, I have held a still-warm beheaded chicken in my young hands. I saw them flop around on the ground till the life-blood was drained from them. I know what their insides smell like and I can still remember the colours of their guts as we helped my mom strip their internal cavities. I have plucked feathers from their cooling bodies and squeezed pin feathers from their pinkish skin. I played with their cut-off feet, because if you know where the tendon is you can pull it and make the foot close like a claw. As a huge fan of the Little House books and with a romantic view of the ‘Olden Days’, I swallowed my disgust at the reality of slaughtering animals that day and in the days to come because I thought that it was what had to be done and also that I wanted to be like Laura Ingalls. At nine, I also witnessed the slaughtering of pigs at a neighbouring farm. I was excited because I loved the people that we were going to visit, and there was going to be a big dinner and it felt very Laura Ingalls-ish. I remember hearing the terrifying squeals of the terrified pigs. I probably covered my ears because it made me so sad and sick to my stomach. When I was allowed to go — after the squealing stopped — I saw the men dipping a big dead pig into a trough of steaming hot water and then heaving it onto a slaughtering table. I remember the bloody neck where the knife had sliced through, silencing the screams. I remember them taking knives and scraping the skin quickly to remove the coarse, white hair from the body. I think I ran back to the house then, because my next memory is going back to the yard and seeing several severed pigs’ heads sitting against the base of the barbed wire fence. It was pretty gruesome. But it was life, right? I mean, we need meat right? Isn’t that what everyone thought? Then the sides of the pigs were strung up and I could see the insides of their bodies. I remember seeing the ribs and thinking that they would be sliced up for someone’s dinner. I remember later looking forward to ‘cracklings’, the bits that were left after the fat of the pig was rendered down into lard. It was a treat that my mom would make us. She would fry it up with salt and we would take pieces of bread and scoop tiny bits of the crispy flesh and eat it. I guess that helped me forget the squealing and the lifeless heads sitting there on the cold ground. But the truth is, it didn’t help me to forget in the end. I think I have a better-than-average memory of my childhood, with some stretching back to age 3. But even so, those memories are strongest that were deeply emotional in some way. I don’t know what you remember of your 9th year, but chances are, they are the traumatic or dramatic memories that you remember in technicolour detail. And these fit the bill. I wish I could convey how vividly I remember everything about these two incidents in particular. If someone had told me that year that I didn’t have to eat meat – or eggs or dairy – to live a healthy life, I probably would have become a vegetarian right then and there. But I didn’t know anyone like that and I didn’t even know what the word ‘vegetarian’ meant. 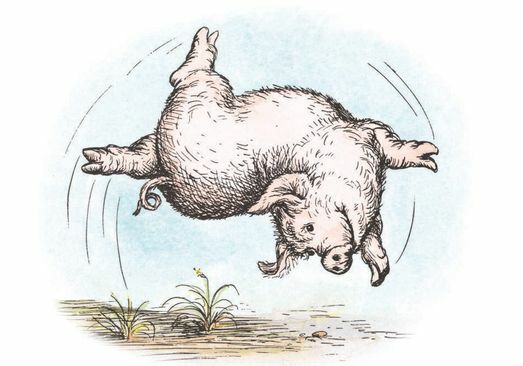 Even in Charlotte’s Web, only Wilbur was saved. Fern’s family didn’t turn their backs on farming and eating animals. I think if Fern had known of such a thing, she would have become vegetarian too. The funny thing is, these were chickens and pigs who had a ‘good’ life. The chickens were in a large pen in a wooded area on a rural property, with lots of places to scratch and peck and do all those chickeny things that they are born to do. They were fed scraps from our kitchen. The pigs had acres of land to root around in. They were killed quickly and didn’t have the trauma of being carted off to a slaughterhouse with all its sights, sounds and smells of horror. But it still felt wrong to do it. It takes some conditioning to normalize such a brutal practice, and we have all been conditioned to suppress our revulsion at the thought of killing animals. That’s why it is uncouth to bring up the subject of animal slaughter at a table where meat is served. No one wants to know or think about it . No one has that objection to someone who says that they picked the carrots fresh from the garden that day! There is a kind of joy that comes when your actions and values align, and thus my excitement for this new way of plant-based cooking. Indeed, if there’s any take-away from my experiences, it’s that I wish I had made the switch to veganism sooner.